Weekly Religious Education: Weekly religious education and preparation for the Sacraments are provided in American Sign Language for children who are deaf. Contact Sr. Kathleen Schipani for information. Family events and other activities assist families in the religious formation of their children who are deaf or hard of hearing. Parent Religious Sign Class: This year during class each Sunday we will have a Religious Sign Language Class for parents. Ms. Gina Procopio and Ms. Charity Johnson will teach that class to the parents who can stay. This will assist parents in teaching prayers to their children in American Sign Language. Also parents and students from Archbishop Ryan School for the Deaf are welcome to attend this class. Adult Bible Study and Religious Education: Adult religious education, faith sharing and bible study occurs regularly. Contact the Deaf Apostolate for more information. Baptism and Marriage Preparation: Contact one of the priest chaplains or Sr. Kathleen Schipani to begin preparation for the Sacraments of Baptism or Marriage. 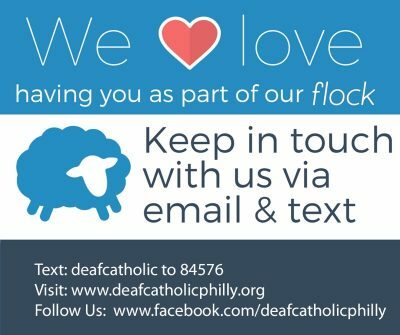 Rite of Christian Initiation for Adults: Deaf Adults interested in knowing more about the Catholic faith or who want to join the Catholic Church through the Sacraments of Baptism, Eucharist and Confirmation can contact the Deaf Apostolate to set up sessions.